Level 1: Very easy! You can drive it with a Honda Accord. Level 2: Easy. High clearance vehicles recommended. Level 3: Leave the Accord at home! This trail may require the use of 4WD (AWD is not 4WD for all intent and purposes). Level 4: 4WD vehicles with a lift and larger tires may be necessary. Level 5: Half-way through our rating system! A level 5 trail is moderate. 33" tires, traction aided differentials and a winch are recommended. Level 6: An experienced driver with 33s will be appluaded! Front and rear differential lockers should be considered. A winch is mandatory. Vehicles without armor and skid plates will probably be damaged. Level 7: Trade in the 33s for 35s. Lockers are a must. Where is your winch? This trail is difficult! Level 8: A well equipped vehicle and driver are strongly recommended. 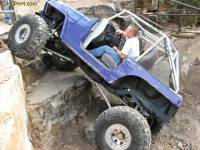 If you are unsure about taking on a level 8 trail, you and your vehicle are probably not ready. Stick to the lower level trails! Level 9: This trail is very difficult. Vehicles with 37" or larger tires, Dana 60 or stronger axles and experienced drivers are a must! Expect to winch and get damage! Level 10: This trail is extremely difficult! Purpose built vehicles (buggies and Tube Cars) with experienced drivers may not even complete a level 10 trail! Very few of these trails exist. If you think you're on one, you're probably trespassing. HCP4X4's Trail Difficulty Levels are only intended to be as a reference guide. Trail and weather conditions can change at any time. Please use common sense and be safe! Always remember to "Stay The Trail" and "treadlightly!" Have Fun! This trail starts out on a gravel road than turns into a scenic, wooded trail until you get above tree line. Locking differentials and a winch are recommended. Due to snowfall at the end of RedCone, it may be impassable into August. Combining this trail with Webster's Pass and Handcart Gulch makes for a great day. Scenic, wooded trail with water crossings, lakes and tundra. Holy Cross City mining town located near top with two buildings. Stopping point for most is at French Creek. The trail becomes more difficult beyond French Creek especially, after the city. 33" tires, locking differentials and a winch are recommended. Vehicle damage and unpredictable weather possible! Description: Very difficult, challenging trail system. Trail splits to Liberty, which is longer and easier than Patriot. A minimal tire size of 35” is needed. Front and rear lockers are required. A winch is a must! Armor helps because, body damage is likely. Pictures taken by John Kruse 11/18/2007. Taylor Mountain is a great easy drive that leads you from Garfield, on the east side of Monarch Pass, back towards Salida. The road does take you through an active quartz mine, the Lilly Mine. Please leave the area like you found it, follow the signs and stay on the Forest Service road. The road comes to a Y. Take the right fork. At the next fork go to the right. This intersection is above tree line. If you continue straight at this point it is a narrow and dangerous path that has no good point to turn around as it leads to a dead end. You will come to one more intersection. The left takes you to an abondoned quartz mine and the right continues the trail and will wind down the mountain back towards Salida. This trail is not recommended for a full size vehicle such as a pick up or suburban as it is very narrow above tree line. The top half of Mt. Antero is a shelf road and is not recommended for anyone that is not comfortable with ledges and tight switch backs. This trail is also not recommended for full size vehicles. This is for experienced drivers only. Mt. Antero was named for Chief "Graceful Walker" Antero of the Unita band of the Ute tribe. It is one of the 14ers and rises to 14,269 feet. 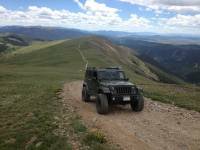 The driving trail takes you to roughly 13,900 feet where you can park and continue your journey to the peak of Mt. Antero on foot. Mt. Antero is rich in aquamarine, topaz and quartz crystals, hence why you will see people with a pick ax and a bucket when at or above tree line.